An illustration from the first publication of Saintpaulia ionantha, in Gartenflora (1893). This publication established both the genus Saintpaulia and the type species ionantha. The earliest collection of any African violet by Europeans appears to have been in 1884 by Sir John Kirk. The material was sent to The Royal Botanic Gardens, Kew, England. However, the poor quality of the material prevented Sir Kirk from receiving recognition for the discovery of a new plant species. Three years later, in 1887, the Reverend W.E. Taylor collected an African violet specimen from what he indicated to be the Giryama and Shimba Mountains in southeast Kenya. He sent the material to the British Museum in London, but again the material was scanty and a new plant identification could not be positively determined. Illustration of flowers and flower structures from Gartenflora (1893). The collection of African violet material that led to its recognition as a new genus and species took place in 1891 by Baron Adalbert Emil Walter Redcliffe Le Tanneux von Saint Paul-Illaire. He sent plant material to his father in Germany, Hofmarschal Baron Ulrich von Saint Paul-Illiare. Baron Ulrich von Saint Paul-Illaire shared seeds and plant samples with the Master Gardener of the Herrenhausen Greenhouses, Hermann Wendland in the fall or winter of 1892. The Herrenhausen Botanical Garden exhibited the plants under the name “Usambara veilchen” (Usambara violet) at the International Horticultural Exhibition in Ghent, Belgium, April 16-25, 1893. The Usambara veilchen generated a great deal of excitement at the show and shared the honor of being the most interesting new plant exhibited. 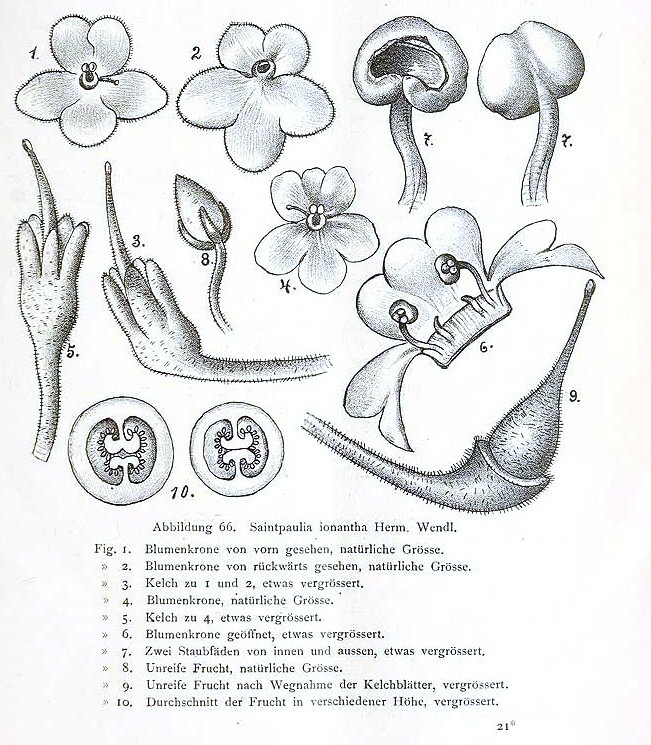 Wendland described the African violet as a new genus and species in the journal Gartenflora, Berlin in 1893 and also in the German trade magazine for the commercial grower, Möllers Deutsche Gärtner-Zeitung, Erfurt on May 20, 1893 (edition 16, volume 8). Wendland named the new genus, Saintpaulia, honoring the father and son responsible for its introduction into Europe. The species name ionantha is from two Greek roots, ion meaning “violet-like” or “violet-colored” and anthos meaning “flower”. 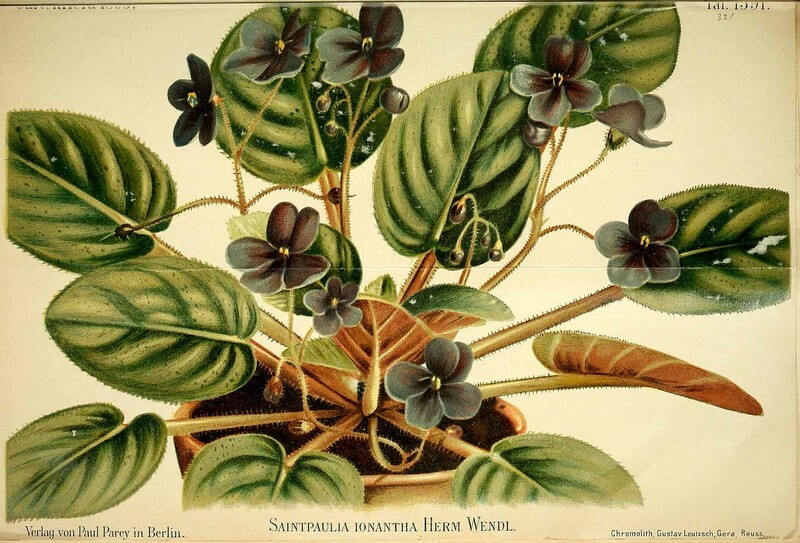 Wendland’s Usambara veilchen was soon translated to “Usambara violet”, but later commonly substituted by “African violet”, the well-known English name for these plants.